SOURCE: AP/Bullit Marquez Agricultural innovations through modern biotechnology have delivered significant economic, environmental, health and consumer benefits in recent years, but the full potential is even greater. In order to feed a growing, hungry world amidst a warming climate, we have to produce more food. Solutions to the problem of how to increase crop yields include both ecology-based farming and biotechnology approaches. But how do we define biotechnology? And can it support progressive approaches to improving prospects for the poor farmers of the world? This series on the issue gathers perspectives from experts who take a hard look at the science, the economics, and the complexities of agricultural development. 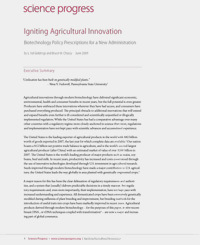 Agricultural innovations through modern biotechnology have delivered significant economic, environmental, health and consumer benefits in recent years, but the full potential is even greater. Producers have embraced these innovations wherever they have had access, and consumers have purchased everything produced. The principal obstacle to additional innovations that will extend and expand benefits even further is ill-considered and scientifically unjustified or illogically implemented regulation. While the United States has had a comparative advantage over many other countries with a regulatory regime more closely anchored in science than most, regulations and implementation have not kept pace with scientific advances and accumulated experience. The United States is the leading exporter of agricultural products in the world with $82 billion worth of goods exported in 2007, the last year for which complete data are available. Our nation boasts a $12 billion net positive trade balance in agriculture, and is the world’s second-largest agricultural producer (after China) with an estimated market of value of over $200 billion in 2007. The United States is the world’s leading producer of major products such as maize, soybeans, beef and milk. In recent years, productivity has increased and costs constrained through the use of innovative technologies developed through U.S. investment in agricultural research. Seeds improved through modern biotechnology have made a major contribution to U.S. agriculture; the United States leads the way globally in area planted with genetically engineered crops. A major reason for this has been the clear delineation of regulatory requirements and authorities, and a system that (usually) delivers predictable decisions in a timely manner. But regulatory requirements and, even more importantly, their implementation, have not kept pace with increased understanding and experience. All domesticated crops have been extensively genetically modified during millennia of plant breeding and improvement, but breeding methods for the introduction of useful traits into crops have been markedly improved in recent years. Agricultural products derived through modern biotechnology—for the purposes of this paper, in vitro recombinant DNA , or rDNA techniques coupled with transformation—are now a major and increasing part of global commerce. The techniques of in vitro gene transfer are faster, more precise, more predictable, and better defined than older methods of catalyzing the genetic modification of crops. By expanding the selection of genes that can be incorporated into new varieties to include genes from essentially all living organisms, recombinant DNA technology allows researchers to introduce new beneficial traits that would be difficult or impossible to create with any other breeding technology. This has allowed for the development and commercialization of crops with innovative improvements in performance. In the United States today, 86 percent of the cotton harvest, 92 percent of soybeans, and more than 80 percent of the corn harvest consist of varieties improved through biotechnology. In a world where global agricultural commodity trade is increasingly competitive, improved qualities, value, and production efficiencies provided through biotechnology have preserved jobs here at home, especially in rural areas, by enabling U.S. farmers to remain powerful players in the global market. While the number of individuals directly involved in farming continues to decline, other jobs related to agricultural production are on the rise—with a portion of the increase coming from high paying jobs in biotechnology and related science fields. And the United States continues to retain a leading global role as agricultural exporter despite dramatic increases in production from other countries, including those with much lower labor costs. Although the food and agricultural sector appears secure and profitable, both U.S. and global agriculture face a staggering array of challenges. These include factors as varied as shrinking land and water resources, rising energy costs, the effects of global climate change, and competition between food and industrial (biofuel) uses for agricultural products. Recent events have shattered the illusion that there is a surplus of food in the world, and world food reserves have recently been at an all time low of 53 days. Over 850 million people are malnourished, most of them in developing countries, and over 1.2 billion live on less than a dollar a day. Despite years of international efforts by affluent developed countries led by the United States, after decades of decline the number of poor and hungry in the world is again growing in parallel with increasing population. The primary biotechnology crops planted in the world today are insect protected and/or herbicide tolerant varieties of corn, soybeans, cotton, and canola. Brookes & Barfoot show net benefits at the farm level of $6.94 billion in 2006 and $33.8 billion over the prior eleven years. They also show a 286 million kilogram reduction in pesticide applications leading to a 15.4 percent decrease in the environmental impacts associated with their use. Associated greenhouse gas emissions were reduced during 2006 alone by an amount equivalent to removing 6.56 million cars from the road. Data compiled by noted agricultural biologist Clive James shows for 2007 a 12 percent year-on-year increase of global biotech crop area (30 million acres/12.3 million hectares), with the total global area devoted to growing biotech improved crops at 282.4 million acres. These crops are grown by 12 million farmers around the world, of whom 11 million are smallholders in developing countries, thus reaffirming the scale-neutrality of the technology. Biotech improved crops are today grown in 23 countries, including 11 industrial and 12 developing nations. While these data show rapid adoption and market penetration of products derived from plants improved through biotechnology, similar rapid growth has not been equally evident in animal husbandry and livestock improvement. Indeed, the transgenic animal product closest to wide commercial availability today (approved in the European Union, and in phase III clinical trials in the United States) is ATryn, an animal-derived drug that helps prevent excessive bleeding during surgical procedures. The animal product perhaps closest to regulatory approval in the United States is a transgenic “advanced hybrid” salmon that reaches market size in half the usual time on 20 percent less food. This has been in the regulatory pipeline for the better part of a decade or more, and is reportedly nearing approval. Numerous other products and applications are in development but the lack of clear understanding on how these products would be regulated has created a perverse incentive that has discouraged investment. Regulatory agencies have grappled with these issues for more than a decade, but a lack of attention by the outgoing Bush administration left proposals languishing in bureaucratic limbo for years, a defect partially remedied in recent weeks by publication of draft guidance by the Food and Drug Administration. Many uncertainties remain, including questions as to how several federal agencies with different or overlapping authorities will coordinate their responsibilities. But concrete decisions emerging from these agencies are the ultimate test and requirement, and a hurdle that remains to be cleared. Dramatic as the advances and benefits from agricultural biotechnology have been to date, they represent only a small fraction of what is possible. While many plants improved through biotechnology have been field-tested,and at least 22 crops have been approved for food and feed use in the United States, the majority of the global trade in biotech-improved crops to date has involved only four plants: soybeans, cotton, corn (maize) and canola. The improvements delivered through biotechnology thus far have been primarily insect resistance and herbicide tolerance. The problem, in fact, is larger than this indicates—a dispassionate review of the global experience to date with field testing and commercial growing of transgenic plants and the underlying science suggests that all existing regulatory regimes apply a level of scrutiny and control that is disproportionate to the risks they seek to manage. Science shows that any regulatory review process that is triggered by the fact that an organism has been modified by in vitro rDNA techniques per se is unjustified. Numerous authoritative analyses have concluded that the potential hazards associated with crops improved through biotechnology are the same as those with which we are familiar from conventional crops. Case in point: The European Commission concluded in 2001 that “the use of more precise technology and the greater regulatory scrutiny probably make (biotech derived foods) even safer than conventional plants and foods.” This conclusion has recently been reinforced by a study from the Joint Research Center of the European Commission. These findings from the epicenter of political opposition to biotechnology in agriculture, the EU, have been confirmed in studies and experience around the world. Indeed, the only findings in the scientific literature which show significantly different levels of hazard between biotech improved crops and other crops favor biotech crops. It is fair to ask, then, how it is possible to justify, other than through bureaucratic inertia and political pressure manufactured by interest groups, a situation wherein the highest regulatory barriers to market entry are placed in the path of products that are better understood and demonstrably more productive, beneficial, and often safer than competing products? Policies adopted by the EU, for example, have created de facto trade barriers that discourage the development and use of transgenic crops. U.S. farmers have been reluctant to plant some biotech improved crops such as wheat, potato, and rice because these crops have not been approved by the EU regulatory system, and out of concern over potential loss of market share. The United States, Argentina, and Canada brought a World Trade Organization case against the EU, which was decided in their favor in 2005. Yet the EU has so far been intransigent in agreeing to any resolution of the judgment against them. Moreover, the EU has invested hundreds of millions of euros in various trade distorting measures, promoting fear and misinformation, and advancing their approach to regulation as a model for other countries. EU support has been targeted at a variety of measures attempting to ensure that developing nations adhere to the Cartagena Biosafety Protocol by installing biosafety systems but which, in fact, create barriers to the adoption of transgenic crops. Not only is the EU unwilling to approve transgenic crops in a timely manner, but after approval for use transgenic crops are discriminated against by a mandatory labeling regime that requires segregation of transgenic from “conventional” crops, which adds 10 percent-to-20 percent to the cost of these commodities and foods prepared from them. What’s more, EU policies and EU civil organizations have focused on keeping biotechnology away from developing countries that most need to improve their agriculture. This politicization of regulation has eroded the role of science and experience, leading to counterproductive policies that add enormous costs to the food and feed system, such as regulatory and compliance costs, the cost of segregation and testing, and numerous opportunity costs. Bruce Ames and Lois Gold (University of California, Berkeley) have described this phenomenon as: “damage by distraction: regulating low hypothetical risks. Putting huge amounts of money into minuscule hypothetical risks has a negative impact on public health by diverting resources and distracting the public from major risks.” The misplaced focus on GMOs also creates damage by diverting regulatory and consumer attention and resources away from real food safety issues, such as food borne pathogens and mycotoxins, which do real harm. In contrast to the EU, the United States relies on regulatory policy more firmly anchored in reliance on science-based risk assessment, in which regulators are directed to base decisions on data and experience rather than political considerations. Existing U.S. policy was set out in 1986, and is widely known as the Coordinated Framework. The scientific consensus that plants improved through recombinant DNA techniques present no novel or unfamiliar risks by comparison with their conventional counterparts justified the use of existing legislative authority granted to the U.S. Department of Agriculture, the Environmental Protection Agency and the Food and Drug Administration. Experience in the intervening years has produced nothing to cast doubt on this consensus. Each of these agencies has put in place regulations, promulgated policies, and adapted them over time, some repeatedly. Indeed, this system has, for the most part, entailed clear regulatory requirements and decisions taken by regulators have generally produced predictable results in a timely manner—affording the United States a comparative advantage over many other countries. But the U.S. regulatory oversight system as it presently functions, is imperfect in the extent to which its regulatory burdens track credible risks or significant uncertainty. Vast experience has been accumulated under existing regulations, especially at USDA, but proposed updates to these regulations fall significantly short of changes justifiable on the basis of experience to date. The situation is exacerbated by lawsuits and court decisions which appear to be driving USDA in the direction of repairing procedural vulnerabilities at the expense of regulatory reforms that would more closely align oversight with genuine risks and uncertainties. While a wholesale overhaul is not required, several updates and course corrections are overdue. The problems created by their absence are best seen by examination of some of the concrete innovations possible with modern agricultural biotechnology, and the disproportionate regulatory obstacles they face. Improved production and quality of fruits and vegetables. There are a great many “minor” crops for which production is constrained by a disease, an insect pest, or another environmental stress or factor for which biotechnology could readily provide one or more solutions. The markets for these products are generally much smaller than those for major commodity crops, making the prospects for recovery of the costs of regulatory approval through amortization of several years of market growth for new biotech varieties much more tenuous. Improved production of medicines through plant made pharmaceuticals. Field trials of plants modified to become more productive and economical sources of innovative medicines have been burdened with and impeded by measures to impose isolation and containment out of proportion to any reasonable estimate of potential hazard. A classic example in this regard is the use of rice economically to produce lactoferrin as a medication to treat childhood diarrhea. Lactoferrin is a protein found in mothers’ milk. 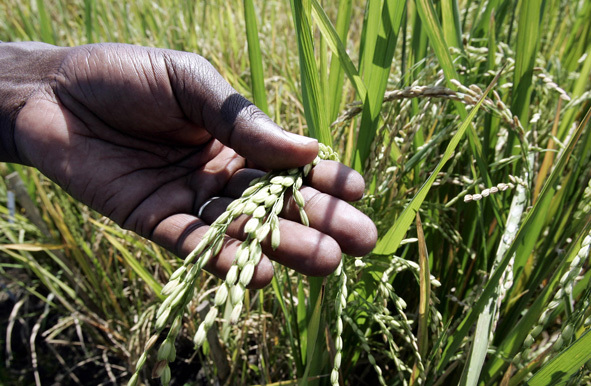 There is no indication its consumption would present any potential for harm, yet permits for field trials have been burdened with onerous requirements to ensure that pollen does not carry the lactoferrin gene beyond the test plots, and absolutely no commingling of the experimental rice is permitted with other rice. Reduced environmental impacts in large scale commodity crop production through improved weed control/herbicide tolerance. Many crop plants carry innate tolerances for exposure to different herbicides as a natural consequence of plant physiology and genetic variation in nature. Crops produced through biotechnology carrying similar phenotypes are subjected to intense scrutiny while those produced using older less precise methods can be marketed without any regulatory review. Experience with the newer herbicide tolerant crops has generated so robust an affirmation of safety that the burden of evidence should now be on those arguing for scrutiny greater than that applied to herbicide tolerance derived through mutagenesis and conventional breeding. Detailed and duplicative reviews for all biotech herbicide tolerant crops are beyond what can be justified by any data on hazard or experience in the field. Future regulatory reviews of herbicide tolerant crops, however derived, should focus only on any novel risks. Improved pest control. Many different agricultural crops possess varying degrees of resistance to different potential pests. Crops enhanced through biotechnology to resist herbivorous insects (“plants with pesticidal properties”) are regulated by EPA under the same laws and with generally comparable methods applied to conventional pest control substances. In a dramatic and unprecedented departure, however, plants containing an insecticidal protein derived (through biotechnology) from Bacillus thuringiensis, or Bt, are required by EPA to be planted under a “resistance management plan.” EPA stipulates setting aside an area (usually 20 percent) for growing non-Bt plants as a means of forestalling the inevitable evolution of insect resistance. Integrated pest and resistance management are clearly valuable, but such “refugia” requirements have not before been imposed on other types of insect protected plants, nor have they been applied to use of Bt as a topical pesticide (e.g., as practiced by organic growers, in the only situation to date where, in fact, resistance has been seen to evolve in the field). Resistance management is an issue of product longevity more than of environmental protection and it can be argued that issues of product longevity are better left to market forces. EPA should encourage innovation and good stewardship in pest management more effectively with a shift towards performance standards and away from rigid prescriptions. This would accelerate the development of pest protected plants incorporating multiple modes of action and other innovative approaches. Improved cellulosic biomass production. Cellulosic biomass is widely used for myriad purposes: in the construction industry as structural material; throughout business, education, commerce and life through paper products; increasingly of late for energy, either directly or through production of ethanol or other energy storing compounds to concentrate energy and make it more easily transported. Several novel sources of cellulosic biomass (Miscanthus, switchgrass, Eucalyptus and poplars) are being genetically engineered in order to make them suitable for efficient and economical pulp and/or biofuel production. The greatest obstacles limiting their development and adoption are regulatory barriers that treat all biotech crops as a suspect class subject to heightened regulatory scrutiny. Regulatory agencies continue, for example, to impose significant constraints on biotech crops in R&D field trials to eliminate any potential for gene flow, even in cases where no possible harm to humans or the environment could result. It is difficult, for example, to imagine an unfamiliar risk from a plant modified to resist a well characterized herbicide, yet new crops containing resistance to such herbicides due to biotech manipulations are subject to scrutiny while similar crops produced conventionally are not. Improved livestock production, Recombinant DNA technology can be used to improve livestock and companion animals in many ways—improved feed conversion and nutritional qualities, shortened time to market, resistance to disease, reduced environmental impacts, improved efficiency as sources of human medicines, and more. Although the emergence of policy guidance and regulations from the FDA has been slow, the principle obstacle here has not (yet) been disproportionate regulatory burdens so much as regulatory uncertainty caused by such delays. The primary cause of the delays appears to have been a failure by the White House Office of Management and Budget’s Office of Information and Regulatory Affairs to allow proposed regulatory guidance documents to be published for public comment. A promising recent development has been the publication of guidance by the FDA detailing how they would regulate transgenic animals and their products. The Agency has assigned responsibility to the Center for Veterinary Medicine to apply regulations governing new animal drugs. It remains to be seen if the resulting oversight will provide scrutiny at levels proportionate to the level of risk and in a timely manner, but it is clear that to unleash this technology and enable it to proceed at a pace dictated by the rate of scientific advance the remedy is simple: the Obama administration should renew the requirement for transparency, and more specifically proportional reviews and timely decisions. Future adaptations of regulations must be delivered through prompt publication of proposed policy documents and regulatory guidance by responsible agencies, accompanied by timely responses and decisions. Lost opportunities and opportunity costs. Regulatory barriers, trade barriers, and the dissemination of deliberate misinformation about crops produced using modern biotechnology have had a chilling effect on adoption of existing approved varieties, and they have discouraged researchers and corporations from undertaking development projects that utilize rDNA technology. Nowhere has this had more damaging impact than in developing nations that suffer from recurrent food insecurity and hunger, and which desperately need to improve agricultural productivity and sustainability. The magnitude of these lost opportunities is difficult to calculate, however, if the productivity gains and environmental benefits reported for four major crops were extrapolated to all crops for which biotech solutions have not been adopted, the lost potential would obviously be enormous. This is setting aside the fact that higher yields and nutritionally enhanced crops such as Golden Rice might have saved millions of lives per year. Biotechnology applied to agricultural has, for good reason, been described as Promethean. It promises to re-shape the relationship between humans and our environment in dramatically greener and more sustainable ways than anything that has gone before. Although the technological challenges remain formidable, the science accessible to us today would enable more rapid innovation than we have seen to date, primarily because of regulatory obstacles for which experience has over the past two decades eroded the scientific justification. There are a number of specific steps that could be taken to reduce or eliminate such obstacles. Fund outreach and education here and abroad. A program to counter misinformation and offer developing countries regulatory models that will create an enabling climate for biotechnology is essential. Regulators from USDA, FDA, and EPA should be a much more active and visible presence on the international stage and in multilateral fora, sharing the American experience with agricultural biotechnology and correcting misunderstandings fueled by opponents driven by concerns unanchored in data and experience. The Department of State should play a larger leadership and coordinating role focusing these efforts on countries of key strategic importance and global significance. Make helping developing countries attain sustainable food security a major priority for U.S. foreign aid, open not only to biotechnology but to all technological innovation. Such a policy would be relatively inexpensive (by comparison with the costs of dealing with consequences of the alternatives, including inaction) and yield beneficial results on numerous fronts, including national security. Reversing the past three decades of decline of support, through USAID, for international agricultural research through the CGIAR would be a good first step. Maintain strong intellectual property protection as an essential stimulus to investment. Intellectual property contained in the genetics of self-replicating plants is easily infringed. The administration should advocate for patent law and PTO administrative reforms that reward private investment in valuable agricultural innovations. In summary, biotechnology applied to agriculture has enormous potential to enhance our ability to develop seeds for improved crops and for enhanced livestock to enable us to meet the food, feed and fiber challenges of a growing world and stressed ecosystems in coming years. Significant impediments are created by unwarranted or outdated regulatory burdens that could easily be removed. The resulting, stronger scientific basis for regulatory oversight will increase the efficiency of regulation designed to prevent or manage risks and uncertainties while enabling more rapid development of innovative, safer products. Benefits to human health, the environment, global political stability and national security would follow. L. Val Giddings, Ph.D, is President, PrometheusAB, Inc. and Bruce M. Chassy, Ph.D., is Professor of Food Microbiology, Department of Food Science and Human Nutrition at the University of Illinois, Urbana. Nina Fedoroff & Nancy Marie Brown. 2004. Mendel in the Kitchen: A Scientist’s View of Genetically Modified Foods. Joseph Henry Press, Washington, DC. 370pp. ISBN 0-309-09205-1. Clive James, 2008. Global Status of Commercialized Biotech/GM Crops, 2007. ISAAA Brief 37-2007: Executive Summary at http://www.isaaa.org/resources/publications/briefs/37/executivesummary/default.html. Combining two or more DNA molecules in the laboratory, and then inserting the resulting DNA into the hereditary material of a plant or animal; also sometimes referred to as “transgenics” or (inaccurately) “GMOs” for Genetically Modified Organisms. Chrispeels, Maarten & David E. Sadava. 1994. Plants, Genes & Crop Biotechnology (2nd Edition). Jones & Bartlett, New York. ISBN-13: 9780763715861. also Fedoroff & Brown, 2004 (note 1 above). Economic Research Service, USDA, 2008; see http://www.ers.usda.gov/Data/BiotechCrops/. Evans, L.T. 1998. Feeding the Ten Billion. Cambridge, New York. ISBN 0 521 64685 5. Graham Brookes & Peter Barfoot, 2008. Global Impact of Biotech Crops: Socio-Economic and Environmental Effects, 1996-2006. AgBioForum 11(1):21-38 at http://www.pgeconomics.co.uk/pdf/agbioforumpaper2008final.pdf. Scott Gottlieb & Matthew Wheeler, 2008. Genetically engineered animals and public health: Compelling benefits for health care, nutrition, the environment, and animal welfare. At http://www.bio.org/foodag/animals/ge_animal_benefits.pdf. See FDA, 2008 (18 September), “Guidance for Industry 187, Regulation of Genetically Engineered Animals Containing Heritable rDNA Constructs” at http://www.fda.gov/OHRMS/DOCKETS/98fr/FDA-2008-D-0394-gdl.pdf. See USDA APHIS data on field trials at http://www.isb.vt.edu/cfdocs/biocharts1.cfm. See, for example, Leonard P. Gianessi, Cressida S. Silvers, Sujatha Sankula, and Janet E. Carpenter, 2002. Plant Biotechnology: Current and Potential Impact for Improving Pest Management in US Agriculture. National Center for Food & Agricultural Policy, at http://www.ncfap.org/biotechcrops.html, and also Gabrielle J. Persley, 1990. Agricultural Biotechnology: Opportunities for International Development. CAB International. Wallingford, UK, 495pp. ISBN 0-85198-643-9. Kalaitzandonakes K, Alston JM, Bradford KJ (2007) Compliance costs for regulatory approval of new biotech crops Nat Biotech 25: 509 – 511. One of the earliest such studies was NAS 1987, Introduction of Recombinant-DNA Engineered Organisms Into the Environment; Key Issues. National Academy Press, Washington. 25pp. A more recent corroboration was Charles Kessler & Ioannis Economidis, 2001. EC-sponsored Research on Safety of Genetically Modified Organisms: A Review of Results. European Commission, Brussels. ISBN 92-894-1527-4. Additional authoritative examples are legion. European Commission, Press Release of 8 October 2001, announcing the release of 15 year study incl 81 projects/70M euros, 400 teams. See (http://ec.europa.eu/research/fp5/eag-gmo.html and http://ec.europa.eu/research/fp5/pdf/eag-gmo.pdf ). See, for example: Munkvold, G. P., Hellmich, R. L., Showers, W. B. 1997. Reduced fusarium ear rot and symptomless infection in kernels of maize genetically engineered for European corn borer resistance. Phytopathology 87:1071-1077; & Munkvold, G. P., Hellmich, R. L., Rice, L. G. 1999. Comparison of fumonisin concentrations in kernels of transgenic Bt maize hybrids and non-transgenic hybrids. Plant Disease 83:130-138. .
 Pressure groups opposed to agricultural biotechnology, such as Friends of the Earth, Greenpeace, and the Soil Association (UK) and a small handful of sister groups have prosecuted major campaigns in opposition to agricultural biotechnology. See http://www.pgeconomics.co.uk/pdf/Global_GM_Market.pdf and Kalaitzandonakes, N., R. Maltsbarger, & J. Barnes, 2001. The costs of identity preservation in the global food system. Canadian Journal of Agricultural Economics 49:605-615. Robert Paarlberg, 2008. Starved for Science: How biotechnology is being kept out of Africa. Harvard University Press, 235pp. ISBN-13: 978-0-674-02973-6; also, 2001. The Politics of Precaution. Johns Hopkins University Press. 181pp. ISBN 0-8018-6668-5; and Jon Entine (ed. ), 2006. Let Them Eat Precaution. AEI Press, 203pp. ISBN 0-8447-4200-7. Bruce N. Ames & Lois Swirsky Gold, 2000. Paracelsus to parascience: the environmental cancer distraction. Mutation Research 447:3-13. See Office of Science & Technology Policy, Coordinated framework for regulation of biotechnology; Announcement of Policy and Notice for public Comment. 51 FR 23,392, 26 June, 1986 also at http://usbiotechreg.nbii.gov/ . See, for example, USDA proposals and comments to the APHIS Docket at http://www.regulations.gov/fdmspublic/component/main?main=DocketDetail&d=APHIS-2008-0023. Ingo Potrykus, 2001, “Golden Rice & Beyond: Emotions are the problem, not rational discourse.” Plant Physiology 125:1157-61 at http://www.plantphysiol.org/cgi/content/full/125/3/1157. See http://www.worldbank.org/html/cgiar/publications/prometh/pscont.html; also Gabrielle J. Persley, 1990. Beyond Mendel’s Garden: Biotechnology in the Service of World Agriculture. CABI Press, Wallingford, UK. ISBN 0-85198-682-X; and Gordon Conway, 1997. The Doubly Green Revolution – Food for all in the 21st Century. Comstock Publishing, New York. ISBN -13- 9780801486104. See, e.g., Geertson Seed Farms v. Johanns, No. 06-01075, 2007 WL 518624 (N.D. Cal. Feb. 13, 2007). The Consultative Group for International Agricultural Research, see http://www.cgiar.org/.